I have 10 precious children that range in age from 25-5 years old. All single births and all unique and wonderful! I couldn't imagine life without one of them. But most importantly, I'm a Christian who loves the Lord and aspires to be all He has created me to be. I've known the Lord since I was 7 years old and was raised in a Christian home in the deep south. I went to college in Oklahoma, where I met my Yankee husband. He was from Long Island and it was love at first sight, even though we couldn't understand each other because we basically spoke two different languages : ) We married right after I graduated college with my nursing degree and he was already done with his business degree. He is my best friend and truly my better half. He keeps me grounded, sane, happy and even got me start blogging. I've had 15 pregnancies over the 24 years we have been married. We've let God decide our family size, not out of some doctrine or religious belief, but because we believe He controls all life and He knows best. If we can trust Him with our finances, our salvation, our eternal life, then I believe we should be able to trust Him with our fertility. We have homeschooled now for 16 years. I started homeschooling when my oldest became kindergarten age. I really did it completely out of obedience to the Lord and thought it would only be for a year or so. Well, it's gone really well and we are still at it. I love getting to spend the time with my children that I would not get to if they were in school all day. Having 4 already in college has really made me realize how fast they grow. It's a blink and they are out of the house. Homeschooling gives me more time with them, and they get more time with their siblings and lets me control what they are taught. I usually homeschool them until high school age and then they go to a Christian school until graduation. This has been a good fit for us. We have a great Christian school less than 10 minutes away that is reasonably priced so we have been very blessed that way. 7 years ago, God blessed us with a son who has Down Syndrome. His diagnosis was somewhat of a shock to us, but he has been such a blessing. We all love and adore him so much. He brings so much to our lives and is actually why I started blogging in the first place. I blog, not to keep friends and family up to date on our lives, even though that does happen, but to help and inspire other moms. Because of this, my blog isn't really a scrapbook, because I try to make each post one that would help a young mom out there. I'm not superwoman or some special person. I'm just a regular mom, who can be rather imperfect at times. God does it through me as I rely on Him. I hope this blog is His blessing to you, my readers. Becca, your blog truly is a blessing to me. As a mother of 6 young children, I gain inspiration and comfort from your posts. You have a beautiful family. God Bless you and your's! My name is Brianne and I just recently started blogging. I am 21 years old and a single mother to a boy with Down Syndrome. I read that you were hoping to inspire a young mom in the world with your story and your family and I just wanted you to know I enjoyed reading your posts. What a great looking family! What a blessing! 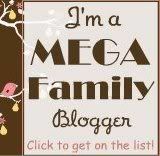 I am so glad I found your blog and look forward to following. I am only in my second year of homeschool with my 5 kids, so I am eager to hear what you have to share! Hello! Im Jihane, wow first of all congratulations you are definitely my inspiration! I discovered your blog yesterday looking for blogs on numerous family and wow, I have already read ALL of your posts and am actually going twice a day to see if there's new things. You are an example, a beautiful family and have a contagious happiness! I am 24 years old, Christian Catholic, happily married, and mom of 2 little girls of 2 and a half years old and 11 months old. My dream is to have a big family like yours, I am feeling this call from God and pray with all my heart that this is his Will and to give me strength, infinite love and sacrifice to be the mother He wants me to be! We have a lot in common in our way to see marriage, parenting, cooking and faith. I am also a clinician nurse from Canada but now a mother at home, and this is what I will be forever! This is really the blog that i needed! I would absolutely love to live in a 10 kids house for a few days to see how it really is! Sincerely, keep writing and congratulations for this beautiful family! God bless you all! I'm simply curious why you call yourself a mom of 10 if you've given birth 11 times....I'm a mommy to 6...my fifth died prior to delivery, he was stillborn but I count him as one of my children. It is still gut wrenching to me when I see someone counting all my kids, or all the ones they see, and when they say "five! are they all yours?" I say, "I just had my 6th"...because my son counts. He was here. He was born. His life was a good thing, even tho he went straight to be with Jesus at 41 weeks...his life counts. His days were ordained. I knew him...I knew his favorite worship songs and played them every night to my belly, we thought about and planned for him every day. I honor him by talking about him, I just have to. The doors it opens to minister to others, or for God to minister to me thru me sharing my story. You are a mama of 11...your sons life was and is eternally a good thing...a heartbreaking thing, a life altering thing, and I'm certain has affected who you are just as your other 10 have. So why not count him? I'm just curious...I know we all do things in our own way. I'm so freshly on this path and I miss my son every hour that I'm awake...I'm still his mama. He counts. Hi Becca! My name is Cameron Von St. James and I had a quick question for you! I was wondering if you could email me at your earliest convenience at cvonstjames AT gmail DOT com :-) I greatly appreciate your time!! Love reading your blogs! They always encourage me. Thank you. So, I was curious.. with your conviction of keeping fertility in Gods hands, are you waiting till menopause? or doing natural family planning? We are in a very tight spot- literally. I would love to have the same heart.. and do, but we have 7 kids in 1100 sq ft. Neither my husband or i have health care. I could get on state Medicaid if i was pregnant (we also get food benefits). We are doing our best to get out of debt and he is working three jobs . I am a homeschool mom, homemaker, doula and work part time on the computer. Praise God this Feb we should only have about 8000 left of debt, not including our home. (sorry for the ramble.) I believe everyone is at different spots. Fearing the Lord is the beginning of wisdom. You can read more of my life on my blog. ;) I do toss back and forth on the subject of having more.. . honestly if I had more space... i would want more! lol.. Your thoughts would be great. from one mama to another ;) You can reply or email me at buckout6atgmaildotcom. Blessings for your time! !